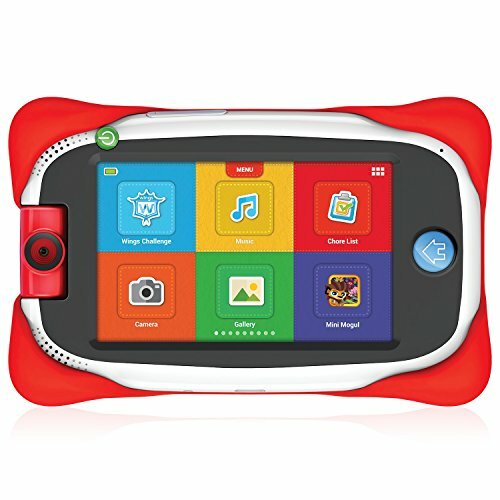 nabi Jr. is the first full-featured learning tablet built just for kids. Like your tablet, it was designed as a tool, not as a toy. A tool for learning, discovering and growing! nabi Jr. is a breakthrough in a category filled with low-quality toys. Great for Early Childhood Education - Comes exclusively with Wings First Steps Plus covering letters, counting and tracing for the Pre-K grade. Wings Learning System is the most advanced tablet-based adaptive learning system developed for skill set mastery and building confidence. Great for Playing - Your toddler will enjoy instant access to over 30 pre-loaded apps and games dedicated to reading, puzzles, counting, matching, first words and more. With tons of fun features, your toddler can watch their favorite movies and TV shows, or even snap photos and take videos with nabi Jr.'s built-in 180° rotating camera. Kid-Safe Out of the Box - From the time nabi Jr. turns on, rest assured your toddler is in a safe and secure environment. They will only have access to apps, games, movies and TV shows that you approve. And, being the first COPPA compliant tablet by TRUSTe ensures that your toddler's information won't be shared with any third party.